The Proteas official No 2 wicketkeeper certainly made his mark in the first T20 against Sri Lanka. 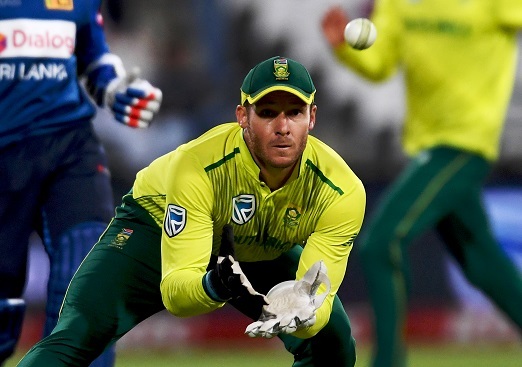 David Miller starred with 41 off 23 balls before striking a six and a four off Lasith Malinga in the Super Over in South Africa’s thrilling win in the first T20 International against Sri Lanka, but his “near-perfect” work behind the stumps stood out just as much. His captain, for one, was delighted at a “big risk” paying off. “We back David with the gloves and we are working with him behind the scenes,” SA captain Faf du Plessis said after the game. Miller, for his part, admitted to excitement and relief. “It wasn’t a shock, but a lot of excitement and emotion. It’s a new challenge that I’ve been asked to do, and I’m not going to turn down,” he said. “It was a tough wicket at the end,” said Miller. In the result, Du Plessis saw potential for learning to play under pressure. “That was great fun – the series needed a bit of a tight finish,” he said.